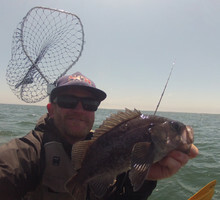 Our kayak fishing clinics cater to newcomers and to experienced anglers alike. Just a short paddle from our dock at the Santa Cruz Harbor are a number of areas productive for rockfish, lingcod and halibut from May through Ocotober! Clinics are limited to six people per guide, so book your weekend trip now. Kayaks, kayaking related equipment, and rod holders will be provided. Participants must bring their valid fishing license. A small amount of tackle and bait will be provided. Allen Bushnell will be kicking off our clinics by hosting the first two dates. He can be heard as co-host on the weekly "fish-talk" radio show "Let's Go Fishing!" on 1340 KOMY in Santa Cruz. 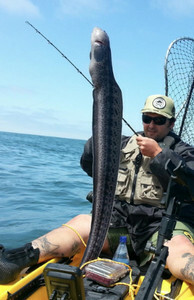 Allen is the June 2003 Santa Cruz Kayak Fishing Derby winner, and writes the regular weekly fishing report for the Santa Cruz Sentinel.